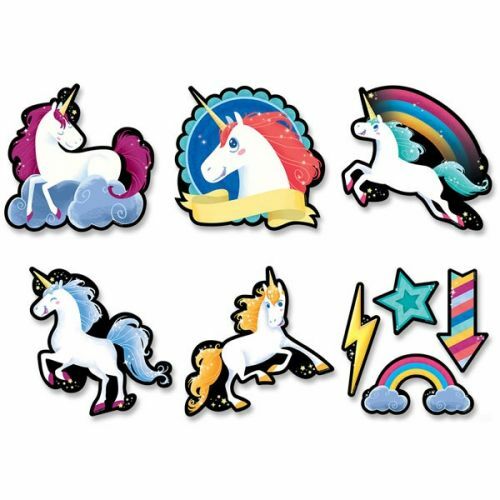 Bring a bit of magic to the classroom with these Unicorn 6" Designer Cut-Outs. They can be used as labels for storage bins, desk tags, accents on bulletin boards, writing prompts, learning center activities, and more! Create a bulletin board or student project around these themes: "Be One of a Kind," "Dream big and sparkle on," "Unleash your inner sparkle," and "Be Unique!". 54 pieces per package. 6 each of 5 unicorn designs (30 unicorns). Plus 24 bonus accents: 6 each of lightning bolt, star, arrow, and rainbow with clouds. Grade K.